Thanks, everyone, for all your prayers, e-mails, phone calls and sms's on the day of Rodger's surgery and following. 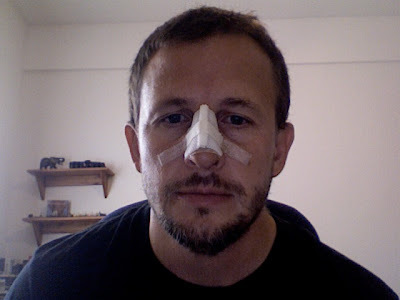 The surgery, to repair the badly broken bridge of his nose and deviated septum(recent basketball injuries) was on Friday in South Africa. Though the doctor said it took longer than he had expected because of the extent of the injury, the surgery was a success. Most colorful! He spoke nothing but Portuguese to all the nurses and doctors and to me, though we were speaking English to him! He was joking with the nurses and doctor almost immediately but he only said one embarrassing thing! He doesn't remember any of it. Please continue to pray for him. He is having alot of pain still and is really, really swollen. 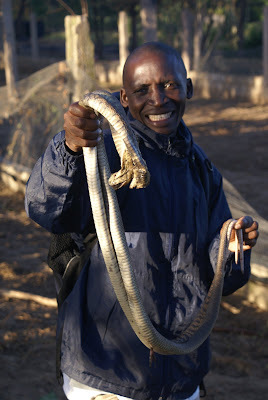 This is Daudi holding 2 of the beheaded snakes found at the job site yesterday. There have been 4 so far. One Mamba and these 2 that we think are puff adders. YIKES!! Please pray for the safety of our guys as they clear the land. Okay, so that was just an "attention grabber" that was meant to make you think, "what are they talking about?" and keep you reading. Although, we may have answers to all your burning questions about chickens and eggs very soon! Why? Because we are doing what no seminary class could have every prepared us for. Preparing to start an egg business. We now have the land and, with help from our interns, are clearing it. Soon, construction will begin on the hen houses. 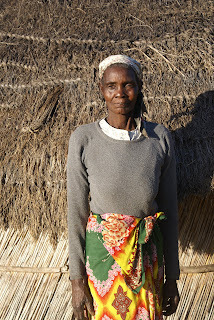 In 4 months, Mozovos(ovos means eggs) will be the proud owner of 5,000 hens, ready to lay eggs. The above photo is of Rodger and the interns at the new land. The tall, distinguished looking man in the back, second from the right, is Senhor Bule. He is the man God brought into our lives to manage the project. The interns have already been hard at work. They have learned the egg business while interning at another business. They are ready to go! The business is being created to help provide a sustainable future for these young men who have been sent by their church to participate with us and receive hands on training in ministry. In addition, they are studying diligently the life of Christ and applying it to their lives and ministry. They are building redemptive relationships with people in the community through English language helps class with us and through inviting their friends to play basketball at our house. 17 years ago...2 crazy kids were married! Didn't we look like babies?